Last Tuesday (30/10/12) started at 6am and finished at 7pm. The day was spent traveling around rural Kaloma calling on rural health centres, promoters and retailers. We delivered vouchers to health centers and promoters and collected vouchers from retailers that they had collected in exchange for Kit Yamoyos. Health centres act as one of the distribution mechanisms for the vouchers and the vouchers are warmly accepted by health centre staff. 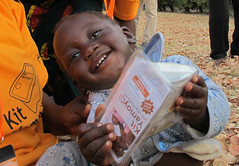 At the one health centre we asked, they had 5 cases of diarrhoea that day and had no ORS in stock. They hadn’t ORS for 3 months. 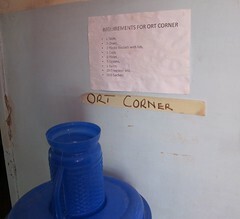 The only two packets in the health centre were in the ‘ORT Corner’ for demonstration purposes. 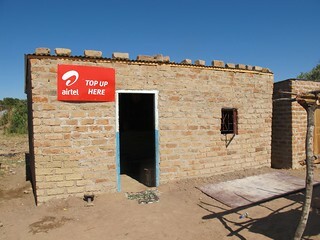 Fortunately, there is a Kit Yamoyo registered retailer just opposite. However, retailers have stock-outs too although only two of the 15 we visited had sold-out and had no stock. This is one of the reasons that we are trying to have two or three Kit Yamoyo retailers in each community. The important thing is that the community does not stock-out. It was fantastic going back to Siachitema. Mainly because I am no longer treated as some sort of exotic beast! It felt a bit like going home. The kids are now not at all frightened of the white giant and were all round me whatever I did. For example, their noses were within an inch of the vouchers I was counting out. We left vouchers with Mrs Banda the OIC at the health centre. She was her normal calm and cheerful self despite the queues of people waiting patiently to see her. We then went to see the two retailers who participated in the test run – Joy and Golden. The big news here is that Golden has built his own shop! I think he was renting his original shop which was much smaller. As the test run retailers, Joy and Golden are on the Zoona system and now that the system is available, Charlotte (the Keepers Zambia Foundation (KZF) Project Officer) was able to remind them how to redeem vouchers and they were both able to do so. Over Monday afternoon and Tuesday we collected 515 vouchers from 14 retailers and made payments. These payments totalled K 2,575,000. The average number of vouchers redeemed is 37 per retailer. This amounts to a gross income of approximately K184,000 per retailer with a gross profit of around K48,000 per retailer. 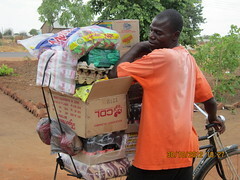 In Lusaka, K48,000 buys a 25kg bag of mealie meal which feeds a family of 6 for two weeks. It’s going to be several weeks before we recover from this position but the manual ‘work-arounds’ we have put in place are working well. All of this could have been avoided if the Zoona training of trainers training had been planned and implemented properly.